It was constructed in the Scots-Jacobean style in 1895-97, the work of Glaswegian architect James Thomson (b1835 - d1905) of Baird &Thomson 88 Bath Street, Glasgow, Scotland. A familiar face on Glasgow buildings, he was born in Glasgow, the son of builder Hugh Thomson. 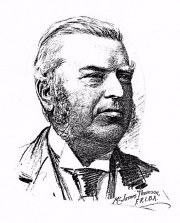 He trained with James Brown (1813-78), and later worked as a draughtsman for John Baird I, from 1848-56, when he became a partner, as Baird & Thomson. During this time he worked on one of the most important buildings of the age in Glasgow, the revolutionary, cast-iron Gardners Warehouse, 36 Jamaica Street (1855-6). After Baird's death in 1859, the practice became one of the largest and most successful in the city, producing houses, terraces, commercial buildings, schools, churches and monuments for cemeteries. But it was not until his sons James Baird Thomson (c. 1869-1917) and William Aitken Thomson (c. 1871-1947) joined him in the 1890s, that sculpture became a significant feature of the firm's designs. 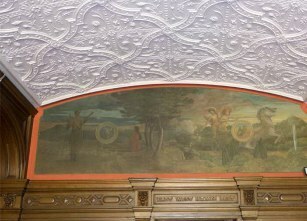 Their preferred sculptor was James Charles Young, who worked on Thomson's buildings from the 1870s until the early 1900s. The architects produced little of significance after their so-called Ritterhaus Renaissance commercial buildings of 1895-1902. Their Ritterhaus buildings are so called after the Ritterhaus in Heidelberg on which they were modelled, and like this they feature a profusion of sculpture, including Thomson's carved portrait. Thomson's earlier work was predominently in the Italian Renaissance style for commercial and domestic buildings, and Gothic for his churches. For Glasgow's Necropolis Thomson senior designed the Charles MacKirdy Monument (1891), the Neilson of Arnewood Monument (1895) and the William Blackburn Craig Monument (1903), and for Lesmahagow Cemetery he disigned the General David MacKirdy Monument (1896). He was an active member of the Glasgow Institute of Architects and twice served as their president. His carved portrait was included on several of the firm's later buildings: Pearl Assurance, 133-7 Renfield Street (1896-7); Connal's Building, 34 West George Street (1899-1900); the former Liverpool and London and Globe, 116 Hope Street (1899-1900) and Cambridge Buildings, 202-12 Sauchiehall Street (1899-1902), all carved by James C Young. In 1896, Thomson was presented with his portrait as a testimonial to his long service to the architectural profession in Glasgow. During his acceptance speech, however, he revealed that his career and life had very nearly been cut short a year after starting his apprenticeship, when he narrowly avoided being a victim of the Theatre Royal disaster on 17 February 1849, when a false alarm led to the crushing to death of many of its audience who stampeded for the theatre's exit. Having a ticket for that evening's performance, he cancelled his visit due to work commitments, and next morning was appalled to see the victims' families crowding Pain's Hospital to look for their relatives. By the time Thomson died on 12 February 1905, his practice was one of the largest and busiest in the city. He died at his home at 20 Lyndoch Street, and was buried in the Necropolis. His gravestone (by an unidentified sculptor) is plain except for a magnificent Corinthian capital set within its pediment. This serves to identify Thomson as a Freemason as well as symbolising his profession as an architect. A further stone was added in 1927, after his grandson William had been buried in the lair, followed in 1947 by the boy's father, William Aitken Thomson, who died on 26 December that year, aged 79. The House features a prominent port cochere beneath a battlemented tower in the centre of the entrance (west) front. The ground floor has a drawing room, library and lounge along the south facade, with an east-facing dining room and a billiard room in the northwest corner. The rooms feature fine fireplaces, wood panelling and plaster-work ceilings. The house has many unique features, an imposing entranceway, oaked panelled hall and a stone stairway of grey freestone, rises to a small landing and then, dividing in two , turns back on itsself to right and left to continue its accent to the large parlour, which is papered with heavy embossed maroon leather all in perfect condition and onto the bedrooms of the 1st floor and unusual Minstrel Gallery. 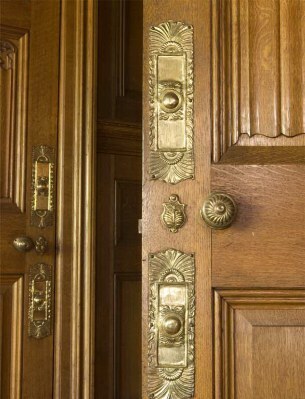 Above each door on the main floor are inscriptions in English and Latin. 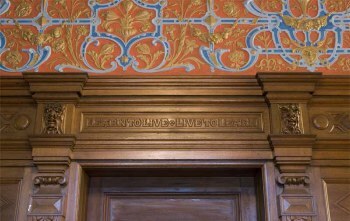 Perhaps the inscription above the Library door "Learn to live, Live to learn" will be the inspiration to all.The woodwork inside the house is of beautiful, hand-carved and inlaid woods with an ornately carved ceiling. 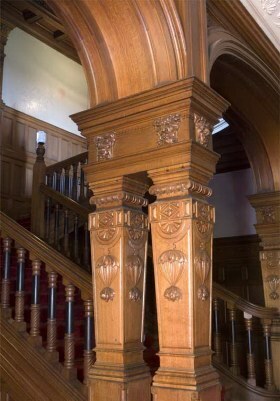 The interior was the work of William Scott Morton, who along with his brother John had established a reputation as Scotland’s foremost interior designers. Their firm of Scott Morton & Co. was established in Edinburgh 1870, with a workshop at Tynecastle and office in St Andrew Square. Along with designs for carpets, tiles, and chimney-pieces, the firm patented ‘Tynecastle tapestry’. This was a wall-covering, with a leather-like material which could be embossed, aged and gilded. As success followed success, the firm also designed whole interiors for Country houses, steam yachts and railway carriages, particularly for Egyptian, Argentine and South African railways.Examples of the company's work inside Kinnaird are shown in the photgrapjhs below. The house, Stables and garden are all listed. 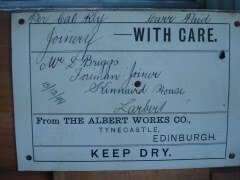 Robert Orr also owned the Lime Wharf Chemical Works in Falkirk. He died in 1906. The Orr family maintained ownership until the late 1930's. On the 28th April 1941 it became the No2 war Office Home Guard School. The school was specifically set up to train the Home Guard from the whole of central Scotland including those from Glasgow and Edinburgh. However in late 1942 the school closed as it became a moble unit, training the whole of Scotland. "see book extracts"
During the 2nd World War, it became the Headquarters of the Polish Army in Scotland. Since then it came under the control of the Secretary of State. It was used for various purposes, finally a store for the Hospital Emergency Supplies. 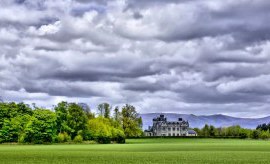 In 1977, John Findlay Russell bought the house and began the task of restoring the house and grounds to something of there former glory. Work by Scott Morton Company Tyncastle Works.